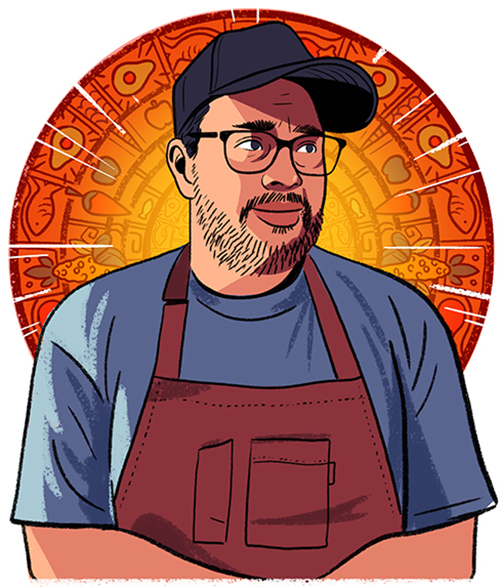 Robert Castañeda, a Los Angeles native, helped popularize the pop-up restaurant concept on the West Coast. Now the chef has landed in Cincinnati, where he’s hosting weekly themed meals at 3 Points Urban Brewery. What inspired you to start doing these pop-ups? I’m one of [a group of] five chefs in L.A. that started the pop-up phenomenon…. We were all trying to figure out how to get more exposure and do stuff that we loved to do instead of being restricted to a restaurant or entity. Pop-ups are a thing where I can do whatever I want without any boundaries. I push the envelope with the molecular gastronomy in an environment or place where you wouldn’t normally get that type of food. What can people expect when visiting your pop-ups, and where can you usually be found? I post everything on Instagram…. We have residency at 3 Points on Wednesdays and Sundays. On Sunday we have brunch, and on Wednesday we just do whatever we want. Recently we had a taco night, and before that we had a Caribbean food night. There’s a couple of things I would love to open. One’s an Old World Mexican cuisine theme, traditional Mayan and Aztec dishes—not your typical taco and quesadilla. The other is a Caribbean concept. I’m working with someone to do one of those or Thai. I’m kind of hoping to elevate the food scene in this city. That’s why I’m here.